Let’s face it, college is not for everyone, but that doesn’t mean you shouldn’t pursue some sort of higher education or job training. Here are a couple of questions to consider. Are you doing something you love, or are you just working for a paycheck? If you’re a recent high school graduate trying to figure out whether or not you should go to college or seek some sort of trade school or vocational training, I want you to know that you are not alone. While many may not admit it, there are thousands of young men an women just like you who haven’t a clue what they should do next now that they have finished high school. So don’t feel bad, it’s OK. Keep in mind, you’ve got your whole life to decide. But don’t wait too long. 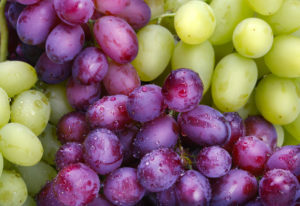 Here is an article that will help. It’s titled: “4-year Colleges vs. Trades Schools Your Choice” the article will help provide you with some answers as you attempt to navigate life’s twists and turns. 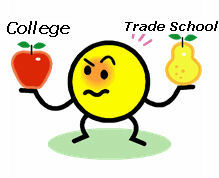 This article provides a comparison of 4 year colleges and trade schools, the advantages and disadvantages of both. So if you want some ideas about which direction you should go or which one is right for you? Check the article out!